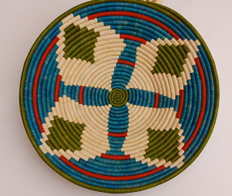 Nubian basketry is reminiscent of Ethiopian basketry and perhaps this is because the Nubians share some ancestry with their Ethiopian counterparts. Nubians have migrated over the years from the north east of Africa to their current homes in Uganda, Kenya, and Sudan. The grandmothers of our current day Nubian artisans brought with them their rich cultural heritage from distant lands and taught their daughters their craft traditions. 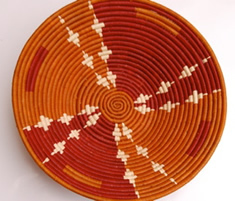 Nubian Baskets, trays, food covers and wall hangings are expensive to produce because the disi material is imported from Kenya and the weaving process is laborious. 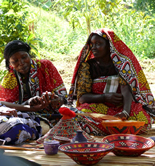 However their crafts provide an important income for many families that turned to selling crafts as a last resort. With help from Uganda Crafts 2000 Nubian artisans have increased their palette of colours from black, yellow, red and green to more vibrant colours including turquoise and brown. Nubians traditionally weave food covers and trays as gifts for young women that get married. These highly decorative pieces can be hung on walls as quirky decoration or used as cheese covers or food covers at out door events and picnics. Uganda Crafts 2000 ltd wants to encourage export orders of Nubian basketry so we have reduced our mark up to make their products more competitive.